Overview: Towards the end of the year I really got into deck-building games, and Thunderstone remains one of my favorites. The base game was a nice introduction to the genre once I understood the rules, and the Wrath of the Elements expansion added traps and some pretty nasty new monsters to the deck. The latest expansion, Doomgate Legion, expands your options even further for more variety with new diseases, some mercenaries and treasures. Ages: Ages 12 and up. Rating: Excellent addition to the Thunderstone universe. Who Will Like It? If you’ve enjoyed Thunderstone, you’ll like the added variety; if you disliked Thunderstone this probably won’t change your mind. I won’t give a full review here—read my previous review for a closer look—but I’ll tell you what’s been added and give you a follow-up on some of my initial impressions. With 317 new cards, Doomgate Legion is a sizeable expansion. There are seven new Hero types, five new Monster types, and a bunch of new Village cards. But what’s really different is the addition of some Mercenary cards to the Village, Treasure cards in the dungeon and a host of nasty new Diseases to encounter. There are five different Mercenaries you can purchase in the Village which will give you benefits in the dungeon—the Pious Chaplain cures diseases and lets you draw cards; the Spirit Hunter provides Magic Attack; the Border Guard can be sacrificed to save another Hero who would have been destroyed in the dungeon; the Fortune Teller lets you draw two cards but you only keep both if at least one is a spell; and the Doomgate Squire lets you use XP to increase a Hero’s attack. All of these are a welcome change from the +1 Attack Militia in the basic deck. Treasure cards can be mixed into the dungeon, giving you some valuable incentives to go fight monsters even when you won’t win the fight. There are three types of Ulbrick’s Treasure, which allow you to draw extra cards or even get an extra turn after defeating a monster. The Amulet Treasures can be destroyed for extra Attack points or money depending on the type of amulet. There’s a Swarm monster which is similar to the Horde in Wrath of the Elements: Each time the Swarm turns up in the dungeon, it is a little bit stronger. Each Swarm card is worth as many points as you have Swarm cards in your deck—so if you’ve only killed one, it’s worth one point. but if you killed five Swarms, then each one is worth five points, for a total of twenty-five. Like the Horde, you don’t want to let any single player kill too many of these. Finally, there’s a new set of Disease cards which can be used in place of the standard set. The original set simply reduced your Attack by one point for each Disease card in your hand when you went into the dungeon. The new ones have other effects, like increasing the cost of cards in the Village, decreasing the Strength of Heroes (which affects the weight of the weapons they can carry), or even costing you victory points if you still have them at the end of the game. While they don’t necessarily make the game that much harder, they add some variety to the regular stack of diseases. One more thing: Doomgate Legion, like the Wrath of the Elements expansion, comes in the more streamlined box with nice divider cards. The base set and both expansions fit into the box, with room for some more. If you don’t have Wrath you won’t have the new divider cards for the base set, but everything will still fit nicely. I definitely enjoyed playing with the new cards, although I must admit that now I’ve got so many options that there are many cards I haven’t ever used yet in all three sets. I still stand by my earlier criticism that the cards are difficult to read: I keep forgetting which little colored circle indicates the XP and which is the victory points for monsters slain, for instance. But I do like the idea of finding treasures in the dungeon occasionally and not just monsters and traps; the new disease deck certainly adds some interesting variety, and the Mercenaries are a great addition—cheaper than buying a new Hero card, but sometimes more useful than just a weapon when you don’t have enough Heroes to carry them. I did try out the Thundermaster intelligent randomizer and I felt like it did help balance the cards a bit so that we didn’t end up with weapons that were useless against the set of monsters available. The one card that never got used was the Tavern Brawl, but I think we were just being nice to each other. Overall, I think it would take a lot of plays before you’d exhaust the possibilities in the base set and first expansion so Doomgate Legion may not be something you need right away. 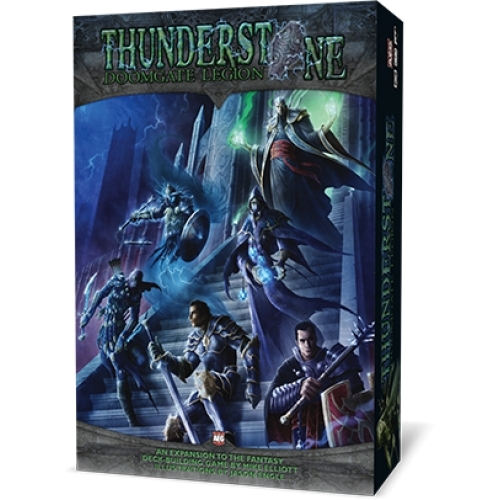 But if you like Thunderstone as much as I do you’ll certainly enjoy the expanded universe that comes with it. Wired: Mercenaries are helpful allies in the dungeon; Treasure cards add some nice surprises; Diseases add some not-so-nice surprises. Tired: If you don’t have the Wrath of the Elements expansion first, the nicer box won’t have come with the nicer dividers for the base set.